For a General overview of 'The Journey to Ukazoo' Book Project, please click on the Start Button below to view the video used in the Kickstarter campaign. 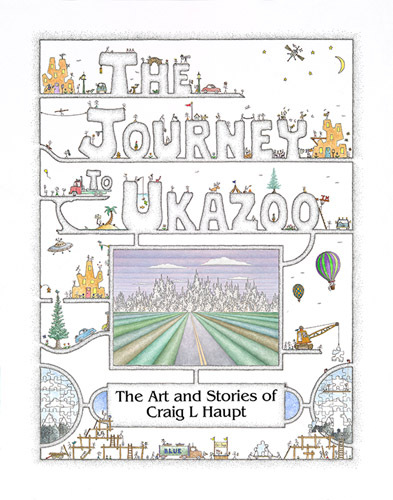 'The Journey to Ukazoo' ArtStory book project ran as a Kickstarter crowdfunding campaign from March 4 to April 3, 2019. It is an investment project. The purpose of the Kickstarter campaign was to secure funding for the digital scanning and publishing cost of a first edition run planned for July, 2019. The PAYPAL buttons act the same way. Your payment will be held in an account to be used when the publishing invoice is due. Upon my receiving the finished book it will either be mailed or hand delivered to all investors of this project. It is imperative that I have both an email address for periodical updates plus a mailing address for the book. Softcover, signed book is 9.5 x 12.5 inch, approximately 140 full-color pages. Cover paper is 100 lb.- Color: 4/4, 4C process, Digital. Text/art paper is 80 lb. - Color: 4/4, 4C process, Digital.